This blog describes the case of a school community collaboration for ESD developed in UK. This is one of the cases collected within the frame of Comenius Network CoDeS. Building Schools for the Future (BSF) was a nationwide programme initiated by the previous UK government to rebuild and refurbish all secondary schools in England. Although there have been many cutbacks all of the secondary schools in Leicester City are still to receive some level of re-development as part of the new scheme. Funding was sought by IESD for a project which engaged the school community in the science, engineering and technology of a low-energy school so that when they were asked to participate in the BSF process, pupils, teachers and governors would be in a better position to make informed decisions for their new schools. In a recent report published by Ofsted, the UK school inspectorate, it was stated that most of the schools utilised within their study had limited knowledge of sustainability and work in this area tended to be uncoordinated, often confined to special events rather than being an integral part of the curriculum The central aim of this project, therefore, was to engage with these school communities in a systematic whole school approach to the issues surrounding low-carbon schools. The project brought together a diverse range of groups from within the academic community, this facilitated communication between school stakeholders and higher education. 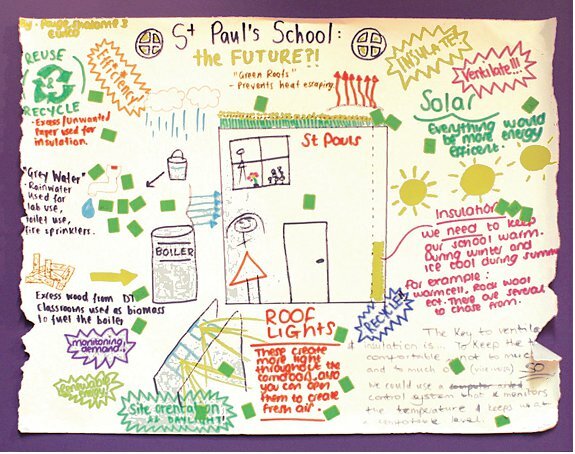 Central to the research was to ensure that pupils, teachers and governors would be able to communicate their developed ideas, wishes and opinions surrounding the design of their schools in an educated and informed way.